I am so very lucky to have standing dates on Fridays when I teach kids how to do things with wool and with yarn. These Fridays are now known as “Fiber Fridays”, and have become a part of my life I am extremely grateful for and proud of. I think about it a lot, why I want to do this stuff with kids. First of all, I have two kids of my own and I relish any chance I get to participate in things in their classrooms. I get to meet their friends, know their teachers and just be part of their school world for a small time, which is amazing. I never leave without internally bowing to teachers, para-professionals, one-on-one specialists, reading specialists, special educators. They make the world go round, in my book. Their love and dedication to the field, and the skills they have, just blows me away. Okay, so yes, I love being in my kids’ classes. I also love going into other classes and meeting even more kids and answering questions and getting excited about new stuff. It’s just fun and a beautiful complement to my work as a psychologist. I’m not being a psychologist in any formal sense of the word when I am in with children on Fiber Fridays. However, I am sharing something that I truly believe is deeply healing to the human spirit, and is a restorative practice. Handwork/fiber craft tie humans together in a most fundamentally ancient and organic way, and exposing kids to as many ways as I know how to work with fiber has become a prized part of my career. In one of my first grade classes (the one my daughter is in), we’ve been exploring wool. We started with real free flowing exploration. I brought in big wool batts, smaller mounds of wool in a variety of colors, some fabric, some yarn, and a needle felting tool for just me to use, just in case some quick stick-togetherness was needed. I showed the class first different ways we can play with wool. I pulled it apart, I twisted it, I formed it into shapes and wrapped them in fabric and tied yarn around it. I encouraged them to just play and sculpt and imagine, and I let them know that there were no specific things they had to make at the end. Each table got its own basket of a big assortment of wool and then, it was off to the races! I was actually amazed, and I learned so much that day of free wool play. Children made babies, cradles, nests, birds, balls, clouds, old ladies, and animals. They played and laughed and shared. For some reason I was really worried that they’d be confused or adrift without a specific goal in mind, but I was wrong! They were happy to just go for it! I was lucky to have plenty of help from the teachers and a parent volunteer with cutting fabric, wrapping, needle felting and tying. It was peaceful and joyful. I do believe working with wool is magical. Two weeks later in the same class, I referred back to our previous experience, and said, “this time, we are going to experiment with wool mixed with soap and water!”. Our project was to make felted balls. Before we began, I first showed them balls I made at home. I also showed them my “oops” items… a disc that was supposed to be a ball… a nest that was supposed to be a ball… a weird creasy ball that was supposed to be smooth. You know, it’s kind of hard, at least for me, to get a wad of wool to felt into a perfectly smooth felted ball with just warm, soapy water and your hands. I don’t know how Martha Stewart does it! And we talked about having one idea in your head when you go to make something and how sometimes it doesn’t turn out like that. I told the kids that we are learning, experimenting, having fun and seeing what comes out of our efforts. On the floor I had set up a drop cloth with towels covering it. On that were six plastic mixing bowls, two with soapy water and four with clear water that had to keep being replaced as kids dipped their creations into them to rinse the soap. Balls were made. Some were smooth. Some were crinkly and seamy. We got a mushroom, some discs and some wild looking blobby alien life form planets, or maybe coral? I saw a bunch of children totally okay with experimenting and just seeing what happened and I think that right there is a major piece of wisdom gleaned from mindful handwork. Freedom to experiment and see what happens, within one’s own heart and spirit, is such a beautiful thing, and it’s something that I think we all should tend to as often as we can. I am often guilty of hanging on so tightly to what my plan is that I forget to see what’s actually happening right in front of me. I forget to loosen my belly and breathe and just let things be as they are. It’s so easy to forget that. You know what else blows kids’ minds about wool and felting? With some simple ingredients and some agitation, soft and fluffy wool is transformed into felt and it is impossible to return it to its original form. I can’t explain why something so obvious is so mystical and amazing to kids, but it is, and I need to meditate on the symbol. Stay tuned. I’ll be sharing more projects and ideas and insights from this cool gig I have. Categories: Fiber Art In Schools, Handcrafting | Tags: art, beautiful oops, children, craft, creativity, education, experimenting, farm to frame, felting, felting balls, fiber art, fiber craft, handwork, inspiration, life, oops, perfection, psychology, school, teaching, Vermont, wool | Permalink. Recently, my children and I hit a sweet, melodic flow. It’s not a coincidence that this occurred organically after I made some concrete decisions to simplify my life a bit, pare down the number of things I consider top priorities (how many top priorities can we possibly have?! ), and just let myself live a little, without letting the constant internal judge that resides in my psyche like a doomsday specter screw up the sweet life I have. 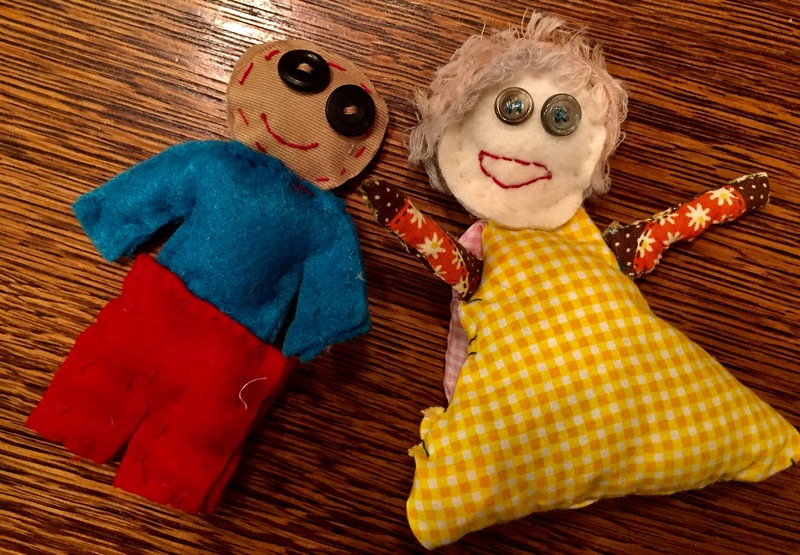 Afternoons after school, I worked on a gift for my cousin and her soon to be born Bebe, and my kids finished these wildly awesome dolls that they have played with every day since. I adore them. On the bus heading to my cousin and her full with baby belly, I just read a cool quote I thought I’d share, too. 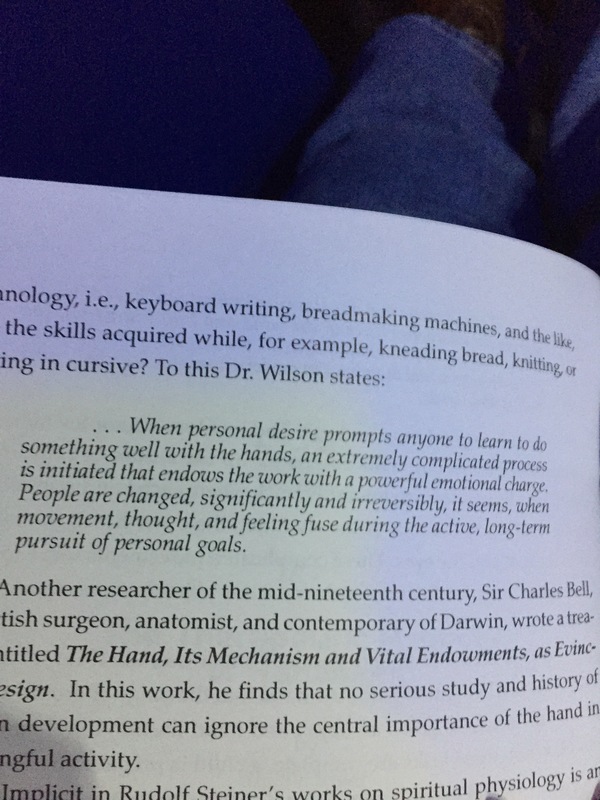 From, Will-Developed Intelligence: Handwork & Practical Arts in the Waldorf School, by David Mitchell and Patricia Livingston, it speaks to why making things from start to finish is so deeply satisfying and important for human beings. I’m working on curriculum ideas for my Farm to Frame series and find this quote a beautiful buttress to my efforts. I’m learning so much from this book. I did not go to a Waldorf school, nor do my children. It’s wonderful finding language, research and guideposts for teaching according to developmental stages. A true gem. I hope you have a lovely weekend, wherever you are in the world. Categories: Handcrafting, Healing and Handcrafting | Tags: children, farm to frame, handwork, priorities, sewing, stress, Vermont, waldorf | Permalink.